As Stephen looked at the big square block of masonry looming before them through the faint daylight, he re-entered again in thought the seminarist life which he had led for so many years, to the understanding of the narrow activities of which he could now in a moment bring the spirit of an acute sympathetic alien. He recognised at once the martial mind of the Irish Church in the style of this ecclesiastical barracks. 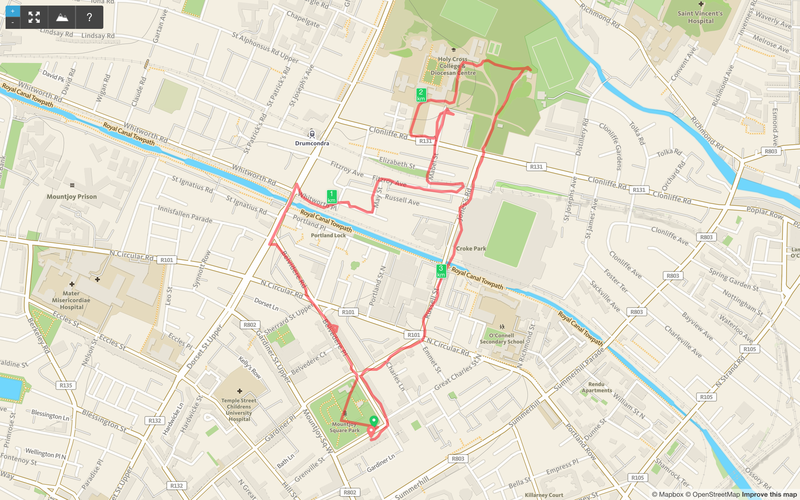 I went on a somewhat aimless run around the north inner suburbs and the backlands that Joyce would have walked through, and ended up going near Holy Cross College, otherwise known as Clonliffe College, which features in Stephen Hero. 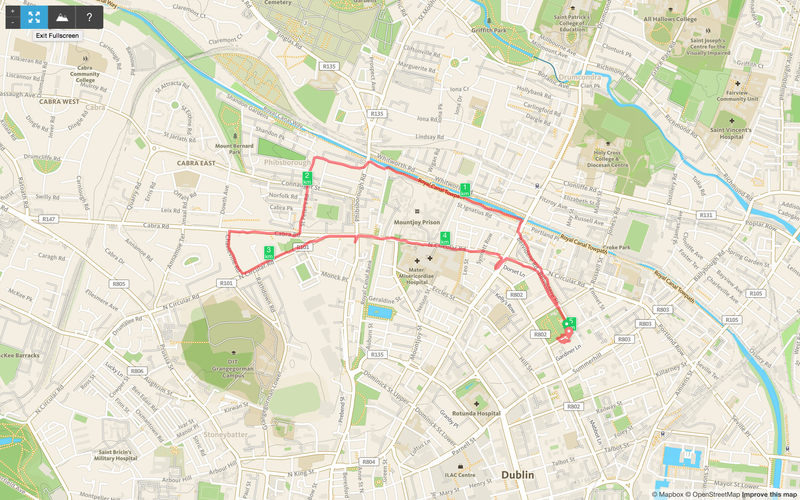 I approached Clonliffe Road from Mabel Street which runs northwards from a backlane alongside the Railway embankment. There is a tree lined avenue that runs directly up to the College which is called Holy Cross Avenue. The Avenue runs directly up to the gable end of Holy Cross Church which looms large over the Avenue and my immediate thought was to photograph some of the imposing facades of the ecclesiastical buildings which feature so prominently in the writings. I read some of Stephen Hero again today and here is a quote from the section where he meets his friend Wells, who invites him into the grounds. The description sums up the impression I had as I looked through the gates from the Avenue. 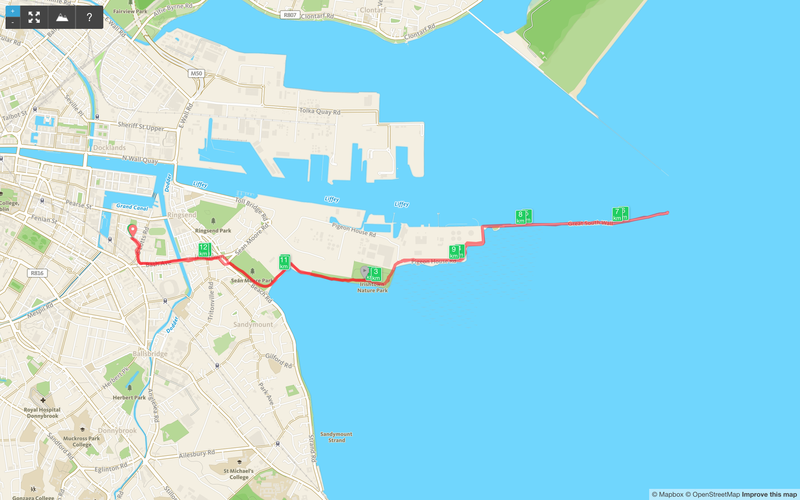 Interestingly he refers to a Handball alley which I cannot see on the Ordnance Survey Maps. Will have to go on another run to see if anything is visible on the ground. This run was all about finding ways of ending the half marathon on the platauplain of Grangegorman, but part of it took me through Cabra and I was reminded of this poem. Joyce spent time in the house at 8 St. Peter’s Terrace which is just off the Cabra Road and would be very familiar with walks in and around the area. If you look at the Ordnance Survey Map online here, you can see how rural the lands above the Cabra Road and again by using the slier overlay you can compare them with the built up nature of today. Joyce, J. (2001) Poems and Shorter Writings. Edited by Richard Ellmann, A. Walton Litz, and John Whittier Ferguson. London, United Kingdom: Faber & Faber.